It’s started finally! Tuesday, March 26, 2013 was DH’s first day in Cardiac Rehab, just over 8 weeks post-op. This was an “intake appointment”, and much longer than the normal ones will be. We got to choose when the future class would be – either Monday-Wednesday-Friday at 7:00 am or Monday-Wednesday-Thursday at 1:00pm. Anyone who knows me knows that I chose the afternoon class. I just didn’t want to get up that early and have to deal with early morning rush hour each of those days. Diana, the intake nurse was very nice – in fact, everyone we met was. First things first – money. We found out that his insurance would pay for most but that there would be a $15 copay each session. However, we did get a parking voucher saving us $5 on the parking garage. We got a packet of information on all kinds of things, including food guides – what to eat, what not to eat. Hooray! I noticed a poster showing the image (right) for choosemyplate.gov. I looked at that site when it first came out – and I’m looking again! Diana was the one who set up the class times, as well. Next was Claire, a nurse. She checked all the meds and vitamins that DH takes. She said that saw palmetto interfered with one of his prescriptions and she suggested we take the list to CVS so that they can look for other interactions. She did an EKG, checked pulse in several locations, looked at the scar, checked blood pressure on both arms (sitting and standing), listened to the carotids. BP was 136/64 right, 112/60 left, 119/70 standing left. She made an appointment with the dietician for Wednesday April 17 at 2:30, after a rehab class. Turns out that there are patient meetings on the second Tuesday of each month. 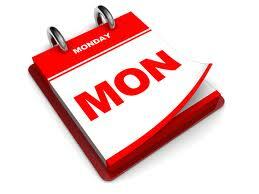 We’re getting very busy with patient meetings, Mended Hearts and rehab plus doctor appointments! They were out of t-shirts his size so we got one that was very large. Another one will be forthcoming…sometime. These shirts are special because they have a pocket for the portable EKG machine over the heart in addition to the obligatory logo on the back. As luck would have it, DH was wearing a t-shirt with a pocket. DH was hooked up to the EKG. I gathered that he’ll do that himself in the future. Next up – Shelly, an exercise physiologist. She talked a bit, asked DH how often he got new shoes. She said that it should be every 6 months. Who knew? She said to drink water every 15 minutes while exercising. When he was done, we went to the Healthy Heart Cafe for a bit of lunch. We got there in plenty of time. DH turned out to be the only person in this class, at least for now. He did his exercises but was told he needed to eat breakfast in the future – his blood pressure was too low. It’s becoming a habit – when he was done, we went to the Healthy Heart Cafe for another bit of lunch. I had bought him a Groupon for a local garden shop as a Christmas gift. Of course, I had no idea then that he wouldn’t be doing much gardening this year. In any event, it was going to expire on March 30, so we went there after rehab and got a few things 🙂 They may all become house plants – we’ll see! Absolute exhaustion by the time we got home. DH finally starts his cardiac rehab today, just over 8 weeks after his triple bypass. Cardiac rehabilitation (rehab) teaches you how to be more active and make lifestyle changes that can lead to a stronger heart and better health. Cardiac rehab can help you feel better and reduce your risk of future heart problems. In cardiac rehab, you work with a team of health professionals. Often the team includes a doctor, a nurse specialist, a dietitian, an exercise therapist, and a physical therapist. The team designs a program just for you, based on your health and goals. Then they give you support to help you succeed. If you have had a heart attack, you may be afraid to exercise. Or if you have never exercised, you may not know how to get started. Your cardiac rehab team will help you start slowly and work up to a level that is good for your heart. 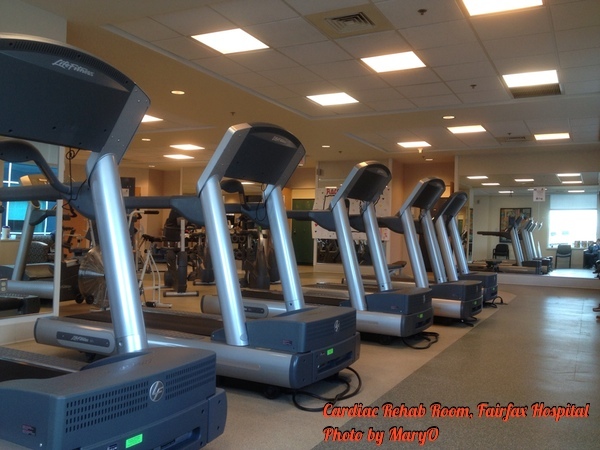 Many hospitals and rehab centers offer cardiac rehab programs. You may be part of a cardiac rehab group, but each person will follow his or her own plan. Who should take part in cardiac rehab? Had or plan to have a heart transplant. 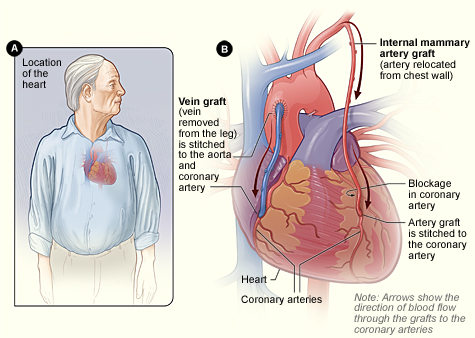 Had angioplasty to open a coronary artery. Had another type of heart surgery, such as valve replacement. Often people are not given the chance to try cardiac rehab. Or they may start a program but drop out. This is especially true of women and older adults. And that’s not good news, because they can get the same benefits as younger people. If your doctor suggests cardiac rehab, stay with it so you can get the best results. Medicare will pay for cardiac rehab for people with certain heart problems. Many insurance companies also provide coverage. Check with your insurance company or your hospital to see if you will be covered. What happens in cardiac rehab? Manage your heart disease and problems such as high blood pressure and high cholesterol. Get back to work sooner and safely. Exercise is a big part of cardiac rehab. So before you get started, you will have a full checkup, which may include tests such as an electrocardiogram (EKG or ECG) and a “stress test” (exercise electrocardiogram). These tests show how well your heart is working. They will help your team design an exercise program that is safe for you. At first your rehab team will keep a close watch on how exercise affects your heart. As you get stronger, you will learn how to check your own heart rate when you exercise. By the end of rehab, you will be ready to continue an exercise program on your own. What are the benefits of cardiac rehab? Starting cardiac rehab after a heart attack can lower your chance of dying from heart disease and can help you stay out of the hospital. It may reduce your need for medicine. Lose weight or keep weight off. Feel less depressed and more hopeful. Have more energy and feel better about yourself. Changing old habits is hard. But in cardiac rehab, you get the support of experts who can help you make new healthy habits. And meeting other people who are in cardiac rehab can help you know that you’re not alone. Among patients with complex coronary artery disease, coronary artery bypass grafting (CABG), as compared to percutaneous coronary intervention (PCI), is associated with a greater risk of periprocedural stroke, but not long-term stroke, according to a new analysis of the SYNTAX trial published on March 20 in JACC Cardiovascular Interventions. At four-year follow-up, there was no difference in stroke incidence between treatments. The SYNTAX trial randomized 1,800 patients with de novo three-vessel and/or left main coronary disease to CABG or PCI. Overall, 33 and 20 strokes occurred at four years in the CABG and PCI groups, respectively. In the CABG group, nine of the 33 strokes occurred within 30 days of the procedure, whereas 18 of the 20 strokes in the PCI arm occurred more than 30 days after intervention. However, in a multivariate analysis, CABG was not significantly associated with an increased stroke risk (p=0.089). In an accompanying editorial, Jesse Weinberger, MD, Mount Sinai School of Medicine, New York, and Craig Smith, MD, FACC, Columbia University School of Medicine, New York, noted that this analysis reports different stroke rates than the original study where rates were higher with CABG than with PCI (2.2 vs. 0.6 percent, p=0.003). The current analysis, “focused specifically on stroke, reports a stroke difference of 1 percent (CABG) vs. 0.2 percent (PCI) at 0 to 30 days by intent-to-treat (p=0.037), and three of the nine strokes in the CABG group occurred pre-operatively, so a statistically meaningful difference in an as-treated analysis is doubtful,” they wrote. 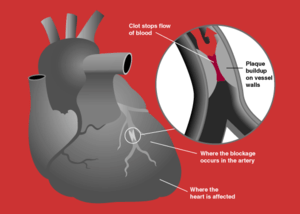 From CardioSource – Short Term Stroke Risk CABG PCI. 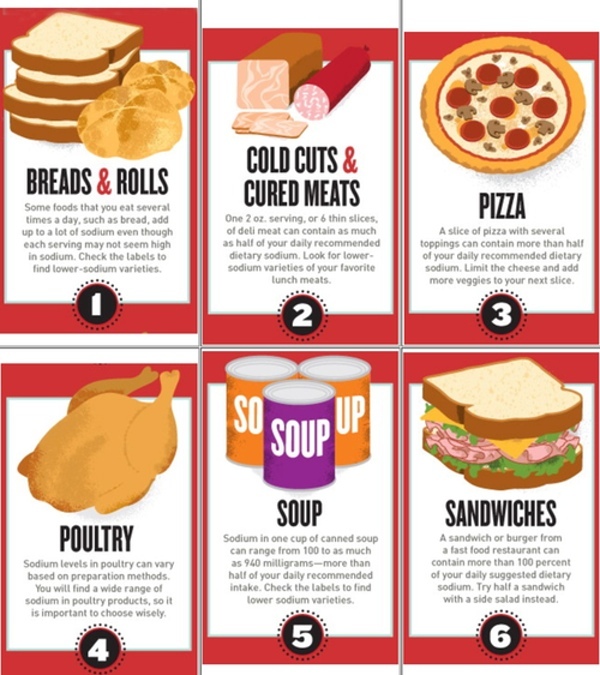 Be sure to keep in mind that different brands and restaurant preparation of the same foods may have different sodium levels. The American Heart Association’s Heart-Check mark—whether in the grocery store or restaurant helps shoppers see through the clutter on grocery store shelves to find foods that help you build a heart-healthy diet. The dramatic, moving stories of three heart attack survivors and their families illustrate the importance of heeding heart attack warning signs and seeking medical care quickly. They vividly convey how a real heart attack may differ from the stereotypical “movie heart attack” and how getting immediate treatment can save lives. The warm and sympathetic narration by an emergency department physician explains what a heart attack is, the treatments that can save lives if given quickly, why many heart attack victims delay seeking care, and how to make a heart attack survival plan. Useful for health fairs, medical waiting rooms, community groups, and home viewing. Producer: National Institutes of Health; Keywords: hhs.gov; public_safety; Creative Commons license: Public Domain. Heart Attack Warning Signs. A heart attack is a frightening event, and you probably don’t want to think about it. But, if you learn the signs of a heart attack and what steps to take, you can save a life–maybe your own. What are the signs of a heart attack? Many people think a heart attack is sudden and intense, like a “movie” heart attack, where a person clutches his or her chest and falls over. The truth is that many heart attacks start slowly, as a mild pain or discomfort. If you feel such a symptom, you may not be sure what’s wrong. Your symptoms may even come and go. Even those who have had a heart attack may not recognize their symptoms, because the next attack can have entirely different ones. Women may not think they’re at risk of having a heart attack–but they are. Learn more about women and heart attack. It’s vital that everyone learn the warning signs of a heart attack. These are: Chest discomfort. Most heart attacks involve discomfort in the center of the chest that lasts for more than a few minutes, or goes away and comes back. The discomfort can feel like uncomfortable pressure, squeezing, fullness, or pain. Discomfort in other areas of the upper body. Can include pain or discomfort in one or both arms, the back, neck, jaw, or stomach. Shortness of breath. Often comes along with chest discomfort. But it also can occur before chest discomfort. Other symptoms. May include breaking out in a cold sweat, nausea, or light-headedness. Learn the signs–but also remember: Even if you’re not sure it’s a heart attack, you should still have it checked out. Fast action can save lives-maybe your own. After you learn more about heart attack, try a brief quiz to see if you know what to do if you or someone else has warning signs. How do you survive a heart attack? Fast action is your best weapon against a heart attack. Why? Because clot-busting drugs and other artery-opening treatments can stop a heart attack in its tracks. They can prevent or limit damage to the heart–but they need to be given immediately after symptoms begin. The sooner they are started, the more good they will do–and the greater the chances are for survival and a full recovery. To be most effective, they need to be given ideally within 1 hour of the start of heart attack symptoms. You can reduce your risk of having a heart attack—even if you already have coronary heart disease (CHD) or have had a previous heart attack. The key is to take steps to prevent or control your heart disease risk factors. Six Key Steps To Reduce Heart Attack Risk; Taking these steps will reduce your risk of having a heart attack: Stop smoking; Lower high blood pressure; Reduce high blood cholesterol; Aim for a healthy weight; Be physically active each day. Manage diabetes. Things are really getting more normal here as time goes on. 7 weeks ago, I never would have imagined it. DH still can’t drive but he asked to borrow my car one day last week and I said NO. Soon, though. He’s able to put sweaters over his head now, a big improvement from a few weeks ago when he was cutting t-shirts in half and wearing 2, or using a safety pin to hold everything together. Next Tuesday, March 26, he’ll go for his first cardiac rehab. I don’t know if they schedule the “real” ones then, but this is more of an intake meeting and a test to see where he before he can get started. I’ve started resuming my regular activities – on Saturday, I went to a 5-hour with no problem and I wasn’t spending my time worrying, either, although some mornings when he wakes up late, I’ll go check to be sure he’s breathing. One thing I’ve done as part of our more healthy eating – I bought a soymilk maker. I had one in my cart on amazon.com for a while, watching the price. Then, one day, they didn’t offer it anymore. I kept searching on amazon for several days and the next version became available. I put that in my cart and watched. On Wednesday, the price dropped to $119 – $20 less than the first one I’d wanted. I jumped on that and ordered it Wednesday. Thursday, it went back up to $139 so I played that right! The soymilk maker arrived on Saturday and I made almond milk first. Today, I have soybeans soaking right now and will make the first batch of soymilk in about an hour. I just went on amazon to get a link to the one I got and found the price back to $119! It comes with a small bag of Laura soybeans to get you started but I’d already ordered Bob’s Red Mill. Yesterday, I was singing in the choir at church and DH decided to go along. Before church, so many of the choir members and others went over to give him a big hug and say how well he looked. During prayer request time, he stood up to thank the church for their prayers and folks started clapping. After church, we decided to stop for breakfast in a newesh restaurant in the neighborhood. While waiting in line, some neighbors also arrived. They said they hadn’t seen either of us for a while. I mentioned DH’s heart attack and it turned out that other man had had one too, about 15 years ago. They had lots to talk about. The other guy did a kind of at-home chelation which sounded a bit odd but it worked for him to remove calcium deposits. It didn’t sound like anything I’d want to try! This morning I was teaching piano and one of my students is the associate pastor of my church. He said how powerful that DH stood up yesterday and demonstrated the power of prayer. Not much else here – everything’s pretty normal except for not driving or walking the dog but those things will come.